07/05/2013 fcmalby9 Comments on What Do Authors Have in Common with Orchestra Conductors? What Do Authors Have in Common with Orchestra Conductors? The more I write, the more I am aware of the variety of elements involved in creating a compelling story. These elements are all individual parts but they have to be pulled together to work effectively. Alone, each part would sound musical, lyrical, but together they create a depth of sound which cannot be created alone. I used to play the clarinet in various orchestras and jazz bands and, while I also enjoyed playing music alone, nothing matches the sound of an entire section, woodwind in my case, or a whole orchestra. Some sections alone sound fragmented, have you ever listened to a double bass playing an orchestra piece without the rest of the string section? Unless it’s a jazz improvisation it might sound staccatoed and uncomfortable. When you create a book you look at the story arc, the balance of dialogue and narrative, points of view, pace, action, language. 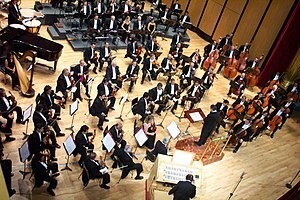 When you conduct an orchestra, you need to see the different sections: string, wind, brass and percussion. Within each section are the individual groups of instruments. In the strings you would hear the violins, violas, chellos, double basses, and so the list would go on with each of the other sections. The conductor needs to be able to hear each section and filter out the other sounds as well as to be able to hear the collective sound. He or she needs to pull the instruments in at the right time, control the tempo and the volume, and to be able to create an even balance. In the same way an author needs to be able to look at the different sections of the book, and to hear the sounds and feel the rhythm of the story; to be able to create balance in pace and point of view, a balance between high emotion and lower points of tension, a balance between dialogue and narrative prose. The threads within a story weave together in a similar way to the instruments within an orchestra. If anything sounds off it can run the risk of throwing the rest of the story off kilter. There is a delicate balance between the threads, requiring the skill of a competent author or conductor, and at different points in the story and the music there will be certain elements that will be louder and clearer, more dominant, while others subside. The balance can make or break the overall sound and quality. I absolutely agree. And it’s not easy getting the individual aspects right to get the overall ‘thing’ exactly as you want it. The subtlety, texture and balance can be so elusive. Yet they are what making writing – and reading – so enjoyable. So true. Striking the right balance is difficult but it is also satisfying when it workks. Thank you, Tom. A really interesting read. Thanks for a very thought provoking post. It’s an interesting analogy and one that I think I agree with. It’s something I’ll think about as I edit my first novel. Thank you, Kendra. I’m glad it was helpful and best of luck with your first draft. This is such a great post. I definitely agree that approaching writing in this manner leads to the most beautiful and balanced results. Especially when reading the text aloud. Generally, the books that I struggle with tend to lack such careful layering and organisation, and they simply become hard to read. Thank you, Lucy. Layering does create a depth and an interest in a book that could otherwise fail to capture your attention, and keep it!